Save $18.55! 2 flute, carbide tipped router bits. Drawer Lock bit attaches sides to front of drawer. Glue Joint bit makes a reversible glue joint with 50% more gluing surface. 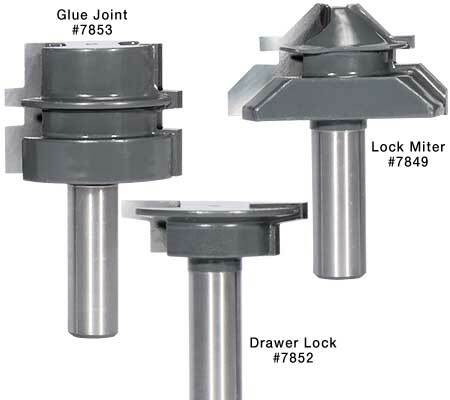 Lock Mitre bit joins materials by cutting a 45° mitre and a matching tongue and groove joint. SAVE $18.55! 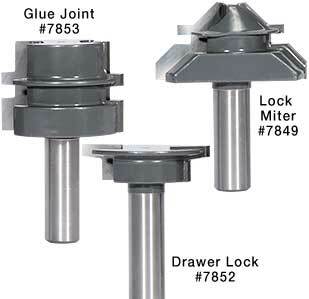 Includes 1/2" shank bits: Glue Joint #7853, Drawer Lock #7852, and Lock Miter #7849. List $98.50. Chart features each router bit from the set above. Set-up block pre-cut profiles ensure accurate setup every time.